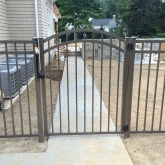 Roots Landscaping provides fence installation and repair to residential and commercial properties of Washington, CT. Our team is comprised of professional, experienced contractors who have the expertise to provide you with quality service. 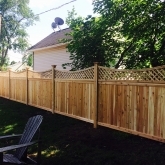 From small to large fencing needs, we are equipped to handle the project and build you a solid, beautiful fence. 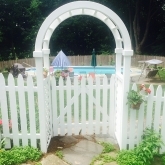 Roots Landscaping is excited to offer Washington, CT residents an opportunity for custom and affordable fencing services. 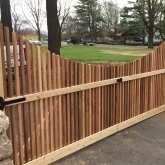 Roots Landscaping offers a variety of fence options to settle all your needs. We recommend thinking about why you deciding to build a fence. For example, you may want a fence for extra privacy or to keep you children and pets safe. In addition, you may just be looking to add a nice fence piece to your landscape. 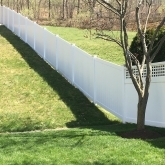 Whatever the reason may be, our professionals are here to guide you in the right direction for you commercial or residential fencing project in Washington, CT.
We provide full service fence installation from consultations to execution for Washington, CT residents. Ensuring that your fence is properly installed helps you overcome unexpected issues or timely delays. Our team of professionals will provide you with a full evaluation, including an estimate of the costs required to install your new fence. Roots Landscaping will perform a full measurement of the area you wished to be fenced, making sure to include the topography in order to ensure it’s full installation. All costs will differ based on height, length and material used for the fence. It’s also important to consider how much labor may be needed to level out the topography and ensure that it is properly installed. 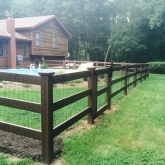 At Roots Landscaping, we specialize in repairing old or damaged fences. Instead of spending unnecessary dollars on buying a new fence and having it installed, you can often just upgrade your existing one. Our professionals will come out to inspect your existing one and provide you with a quote of the projected cost to fix it. Rotting Wood is among one of the most common problems when it comes to damaged fences. Wood rots through a slow decomposition from natural processes like rain, hail, snow and other precipitation. This causes fungi to grow as it eats away at the wood. The best way to prevent and treat this is by chemically treating the wood by staining, patching and repainting. If you are unsure of the extent of the damages, a Roots Landscaping contractor can come take a look and determine what steps would be the best take. We may recommend repairing certain sections or completely rebuilding the fence based on the damage. We are Washington’s trusted fence installation and repair crew and are here to help you. Fence poles provide the structure integrity of your fence. When poles become damage, the fence will begin to shift and fall over. Regular maintenance and repair can help preserve the fence and save you important costs to your Washington home or office. Holes and cracks will vary depending upon the type of fence you have. For example, you fence may be vinyl, aluminum, chain, wood or other fence material. 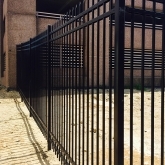 Determining the type of fence will help decipher the best method of repairing hole and cracks. Our professionals will come out to you in Washington to help repair most hole and cracks or recommend another type of repair. The primary reason you want to fix missing boards as soon as they happen is because they can impact the structural integrity of your fence. This can lead to collapsed sections which can be costlier to fix. Our professionals will help determine the source of the problem while providing you with an affordable solution. We’re here to make your fence in Washington strong and lasting. Call Roots Landscaping to learn more how we can help with your missing boards or collapsed fence. 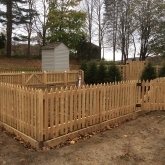 Roots Landscaping provides professional fence installation and repairs, expert masonry and landscaping services in Washington, CT. We strive to provide our customers with quality fencing that adds value to their Washington property. If you would like to install a new fence, repair an old one or learn more about our services, give us a call at 203-304-7326. Roots Landscaping is accredited by the BBB standards. To learn more about how we can help your fencing, masonry and landscaping needs, contact Roots Landscaping today. You may also call us today at 203-304-7326.